According to traffic experts, “late merge” is the most efficient and safest way of merging traffic on the highway into one lane. It ensures smooth traffic flow. However, many drivers don’t consider this as an acceptable strategy typically because it clashes with our old-school traffic flow strategy of “early merge”. To understand these two strategies better, let’s discuss them separately. Higher congestion is the reason late merge is now legally acceptable and the best practice on roads. According to a study conducted by the University of Nebraska in 2005 on late merge, this method allowed 15% more traffic to flow and move forward than early merging. The late merge strategy is now becoming an acceptable countrywide as traffic on roads has increased dramatically. 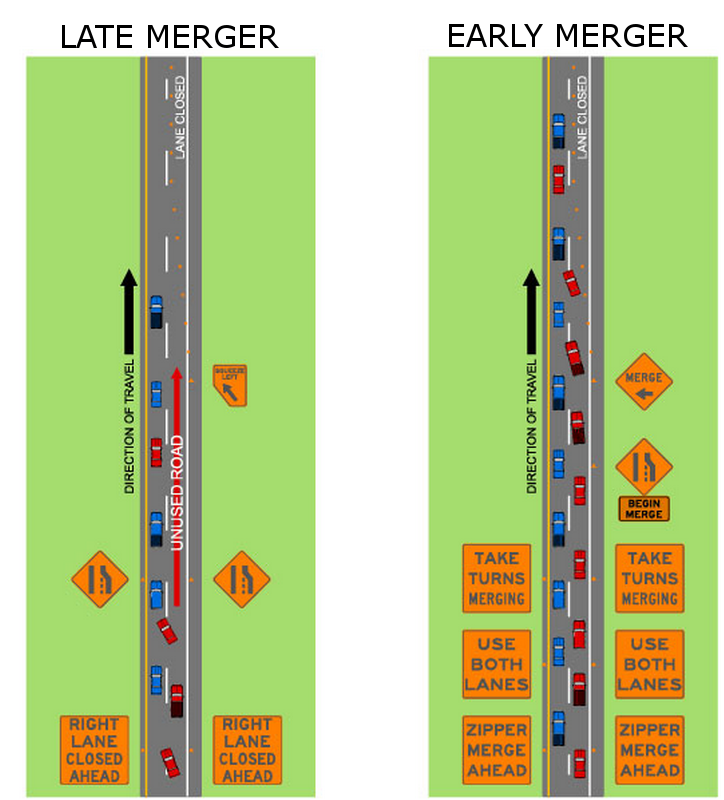 Late merge – also known as zipper merge – is a technique of merging traffic into a reduced number of lanes. Vehicle drivers in merging lanes are expected to use both lanes to move and advance forward to the lane reduction point and merge at that location while taking turns. This strategy is gaining popularity because it reduces traffic backup while increasing safety by reducing speed differences between lanes. Law enforcement promote late merge especially on roads where there is heavy traffic and two lanes of traffic moving in the same direction and one of the two lanes is closed for construction purposes. Under this principle, the traffic moves smoothly on both lanes until the traffic comes across signage indicating merge or road closed ahead. This strategy was used in the ’90s, but less so today. It is not as effective as late merge because it doesn’t use the full capacity of the road, increases the potential for collisions and creates the backup.